A 1982 science fiction/fantasy film directed by Jim Henson and Frank Oz with creature design by fantasy artist Brian Froud. Out of any of Jim Henson's works, this was probably one of the most complex, being done completely with animatronic puppets in the well developed setting of the planet Thra. One thousand years ago, the titular crystal was whole. When it cracked on the day of the Great Conjunction of the planet's three suns, it split its UrSkek keepers into the Exclusively Evil and aggressive Skeksis and the Always Lawful Good but all too passive Mystics (aka urRu). A few centuries later, the Skeksis discover a prophecy that the elf-like Gelflings will heal the crystal, thus undoing their reign, they sent their Garthim to hunt them down and kill them all. All except for the protagonists Jen and Kira, the last of their kind. 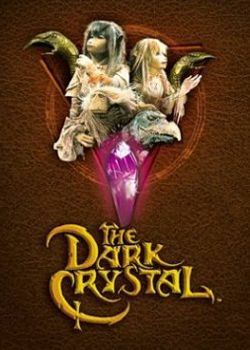 Though it didn't do as well on its initial theatrical run, it spawned a cult following large enough to warrant a spin-off Manga prequel, Legends of the Dark Crystal by Tokyo Pop, a graphic novel prequel trilogy, The Dark Crystal: Creation Myths by Archaia Entertainment, and a sequel long stuck in Development Hell titled Power of the Dark Crystal. Netflix has now confirmed a prequel series due out in 2019, Dark Crystal, Age of Resistance. Age Without Youth: Applies to both the Mystics and Skeksis (though they're not technically immortal), but the Skeksis suffer a bit more from it, especially when you learn that they weren't originally evil, but rather represented the passionate, hedonistic side of the Urskek, and were rather pleasant to party with. Then they aged, for a thousand years. Alien Lunch: Some of the things the Skeksis eat are still alive. Alien Sky: The planet Thra's three suns. All There in the Manual: Pretty much all the names of the Skeksis and Mystics are featured in the novelization and "Art of" book. Animal Eye Spy: The Skeksis with their crystal bats. Animated Armor: The Garthim, evidently. Balance Between Good and Evil: Literally; since the Mystics and Skeksis are actually two halves of one being - if one of them dies, so does their counterpart. The Beast Master: Kira can call out to just about any animal out there and coax it into helping her. There are a lot or weird animals out there and this ability comes in very handy. Beauty Equals Goodness: Played with. The protagonists, the Gelflings, are obviously intended to be attractive, despite any Uncanny Valley that may be invoked by looking at them. The pure urRu are made to look noble and sagacious, and when they die, they fade into sparkles. The Skeksis on the other hand, are clearly intended to look twisted, deformed and vulture-like, which is made even worse by their advanced age. Aughra, however, is quite hideous and warty, yet proves to be a helpful character. A bit of background checking shows that in the grand scheme of things, she's actually supposed to be True Neutral, and not one to take sides. It gets really confusing with the Podlings, who are supposed to be a good, Closer to Earth race, yet somehow they wound up looking cute yet ugly at the same time. Brian Froud did admit that he toned down their appearance from the earliest incarnations, because those were far too grotesque and potato-like. Bizarre Sexual Dimorphism: Gelfling females have wings; males don't. Yet they're never seen to be used to actually fly up. More like |falling with style. In the novelization, Kira explains to Jen that long ago, female Gelflings were able to fly properly rather than just flutter to the ground. A Boy and His X: Though, Fizgig, an alien something like a cross between a terrier and a Pirahna, belongs to the girl, the trope is played straight in the prequel manga. Darker and Edgier: This is a Jim Henson film, the guy who did The Muppets and Sesame Street, although the main concept designer was actually more in the mystical and deep material that makes up the strange creatures. Storywise, it involves mass genocide, gruesome deaths, Fate Worse Than Death and Everything Is Trying to Kill You thrown into the mix. Does Not Like Shoes: According to The Merch (in the form of her 2001 action figure), Kira goes barefoot. Either/Or Prophecy: "...by Gelfling hand, or else by none." Empty Shell: The Podling slaves and the Garthim. The End of the World as We Know It: Or the beginning. Same thing. In the backstory, she lost her other eye and came to be how she looks in the film when she laid on the ground to watch the Great Conjunction. A beam of intense light struck her eye, destroying it and burning her badly. Friend to All Living Things: Kira, thanks to the Podlings. It saves her from being drained by SkekTek later. Fusion Dance: Foreshadowed by the Synchronization of the urRu and Skeksis. Heel Face Turn: Completely subverted with the Chamberlain. Defrocked and kicked out of the Skeksis' castle, he makes obvious peace overtures to Jen and Kira. When Jen stabs him for his pains, he promptly kidnaps Kira and scuttles back to the castle to redeem himself in the eyes of the other Skeksis. Whether he did it because of the hostile reception he got, or because he was Evil All Along, is left for the viewer. Heroic Sacrifice: Many of the cute little fuzzballs that force SkekTek into the bottomless shaft go down with him. Fizzgig too, though he ends up catching hold of something and gets rescued by Aughra. And of course, Kira. Ironic Name: The Skesis scientist's laboratory, where he keeps all those jailed critters and drains Podlings and Gelflings from their vital essence? Its official name is "the Chamber of Life". Conversely, it's a Meaningful Name for the Skesis themselves, as they extract a life-prolonging potion from the Pod People and Gelflings in there. Jabba Table Manners: The Skeksis, Sans SkekEkt, who happens to be a dainty eater. Large Ham: The Skeksis General. Living Relic: Augrha, who is almost as old as the planet. The Load: Arguably, Jen. He rivals the Puma Man as a hero who accomplishes almost nothing. Though this makes it easier to identify with him for young children (who shouldn't be watching this, but yeah). Also justified, since he was raised in a rather sheltered environment, by very gentle and passive minded beings, and wasn't taught much in the way of survival skills (instead receiving education in things like writing and music, which however does prove useful in the course of the story). New Powers as the Plot Demands: Apparently, female gelflings have wings; who knew. No Body Left Behind: Jen's Master disappears when he dies. No Ontological Inertia: If a Skeksis dies, a corresponding mystic dies, and vice versa. Sissy Villain: SkekEkt is the most flamboyant of the Skeksis, but they as whole are rather fragile due to their old age. Smug Snake: The Chamberlain, who is constantly grinning and often humming as he plots. Spiritual Successor: Labyrinth, Mirror Mask, and others. Highly influential within the Fairy Tale branch of fantasy's evolutionary tree. Not to mention the world of practical puppeteering. Staff of Authority - The Skesis emperor carries a scepter which designates his office. In the death scene of the first emperor, Chamberlain indicates his eagerness to take over by reaching for the scepter. There Is Another: Jen believed he was the last surviving Gelfling until he ran into Kira (and vice versa). What Could Have Been: as seen in some of the DVD extras, the Skeksis were originally going to speak an "alien" language. A lot of Skeksis words were kept in the novelization. The Podlings were also supposed to have many eyes coming out of their heads (since they were based off potatoes), but that looked too unnerving, so it was scrapped. When Things Spin, Science Happens: Aughra's oversized orrery. Xenofiction: Fantastic Planet meets Lord of the Rings, rated PG. X Meets Y: Final Fantasy (Pre-VIII) meets The Muppets. This page was last edited on 31 December 2018, at 18:13.